Published: Oct 25, 2012 to ? 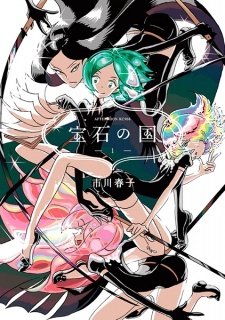 In 2015, Houseki no Kuni ranked at tenth on the Kono Manga ga Sugoi! rankings in the male readers category. 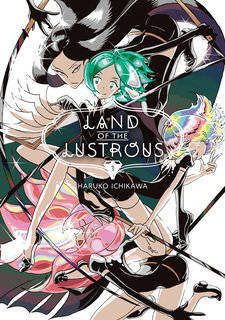 The series has been published in English as Land of the Lustrous by Kodansha Comics USA since June 27, 2017. This review is spoiler-free, i won't give you any information you wouldn't find out by searching it or by reading the first chapters. An absolute joy to read, both on it's visuals and the writing. "Land of the Lustrous" is captivating, it looks like nothing i have ever seen and has an amazing use of the constant black background to craft loads of striking scenes coupled with dialogue that perfectly fits what it's trying to convey, this wouldn't be nearly as much of a masterpiece if didn't had this specific artwork. While it may not be as detailed as most manga are, this kind of composition works together with the narrative to create an absolutely outstanding piece of art. Our protagonist is androgynous looking like almost every character in the story, his goofy and lazy personality allows for a much easier start and for us to easily relate to the character of Phosphophyllite, it tries to drag you in as soon as it can and doesn't waste your time, early establishing the main, elegant-looking enemy and the element that makes the entire story flow as it does, the physicality with which the Gems are broken. Not only does it look great, but it adds to the overall whimsical feeling and plot, by chapter one you already know what can happen to these characters and the chance that they can be rebuilt, it makes you ask questions about the moon and it's dwellers constantly, but you'll have a long way ahead to get those answers. Reading the first chapter again surprised me by how many things it established i just didn't knew where that important and the great foreshadowing, it's very clear that Ichikawa Haruko had a very good grasp of what she wanted this series to be and created a structure in which she could execute all that. It already starts off pretty interesting and good looking, and from then on, it goes to develop and entertain you with different things that have a believable relation, i never doubted the reasons of a character to be where he is or do what he does, and i definitely never doubted the flaws the characters have, they're not perfect, you may think that they would be after knowing how they look, but the first three chapters talks about three different characters and how they are far from perfect. While the moon is one of the main elements of the story and being taken to it is clearly a sign of the characters losing, i felt that maybe it wouldn't have too much tension and payoff to the great buildup, i was terribly wrong, i'm not talking about the answers the series gives later on, even tho they are great, i'm talking about how satisfying it is to watch our character's tales. Every time they broke beautifully, they get rebuilt and as result become easier to be broke again. Some series where characters can't be killed use things like cutting of a limb to take something away from the characters, so having immortal characters that can be rebuilt and not knowing exactly what happens on the moon may sound like the tension would be drain out by the circumstances, but it doesn't, the series actually manages to have a incredibly good body horror aspect both visually and narratively, which creates some of the best looking fight and presentation scenes i have seen in my life. I could go on about the specifics, but that would be spoiler territory, and i don't want to ruin anyone's possible amazing experience with this masterpiece, i strongly recommend this and it's anime adaptation to literally everyone, as even the CG looks great. Fascinating concepts, great character development and portrayal, this manga manages to masterfully balance fantasy, horror, action and comedy in a package that i can easily say will be my favorite manga for a very good time, maybe for the rest of my life, since one of the reasons i don't read too much are because most of then don't interest me and i just find anime to be easier to consume. I can't praise this as much as i wished to, so i'll stop here and go watch something as you go read it, and i hope you find it as amazing as i do. This is one of my top manga series of all time.It's going to be getting an official English release this year and despite the series not being finished yet, i thought it'd be a good time to write a review of it for anyone who's curious about it. The story is very interesting and contains a lot of mysteries. It presents many questions about this world and it's characters. Like, who and what are the moon people? What is the managers goal? Where do these gems come from? and is there anyone else on this world?The series is not all dark and depressing either,as there is a lot of comedy here too which i enjoy. The most intriguing part of this series for me were the gems themselves. All the characters aren't just named after gems, they literally are that gemstone and take on their real world properties.For example, Cinnabar is toxic and keeps himself away from everyone, whilst Diamond is one of the strongest fighters due to his hardness level which prevents him from breaking easily. I really enjoy all the characters in this series,while some get more time in the spotlight than others, their personalities were distinct enough that i remember them well. Phosphophyllite is an amazing main character,without spoiling anything, lets just say he gets a LOT of character development. Also an interesting thing to note is that all the characters are androgynous and refer to each other using male pronouns. Just another element that makes this series so unique. Very stylish. I love how the art shows how shiny these gems are,like how their hair refracts the light onto their shoulders. Although it is a little morbid seeing a character broken into pieces sometimes. The character designs are great too, despite how most of the characters wear the same uniform, their hair styles are unique enough to tell them apart. Backgrounds art is also great, and it really sets the mood in some scenes.I like the use of solid black. Since it's not finished yet and i don't know when it will i'm giving the series a 9 overall for now. If it keeps being this amazing and answers all the questions i have,when it's finished i could easily give it a 10.That's how good this manga is. Please give this manga a go if you're looking for something different from the norm! I really do like Houseki no Kuni's wonderful characters and whimsical fantasy tone -- until it loses it along with most of its charm and Phosphophyllite's sanity. From chapter 19 onward, Houseki no Kuni's tone and pacing suffer bouts of schizophrenia. Excessive and often repetitive action scenes drag out the midsection of the currently released chapters, littered with gratuitous "deaths". The most interesting and nuanced characters are sidelined until all that's really left to focus on is Phos, Cairngorm, and Adamant -- and maybe Cinnabar, too, since the mangaka really likes to remind you that Cinnabar exists just as you're about to forget. Houseki no Kuni's greatest sin is wasting your time, which comes to a head when Phos is forced to learn about the existence of humans again despite already learning the information some 40 chapters earlier. After 40 months (this is a monthly series, so storytelling time is precious), Phos finally learned information they had already learned and then forgotten. No new information is gained, so for the reader this is a colossal waste of storytelling time. The long stretch of fights in the midsection of the 61 chapters play like a groundhog day loop of Phos's failures, wearing down your energy to continue reading. The art is simplistic and rough, with Clamp-like spaghetti limbs. Each of the gems wear the same clothes and have roughly the same face, making them hard to distinguish save for their distinct hairstyles. The roughness of the art begins to take its toll the more Phos's design changes with each "upgrade" they receive. These upgrades come in the form of new materials to replace Phos's lost body parts, roughly corresponding to the Seven Treasures of Buddhism and meaning to date there are likely 2 more upgrades left. This gives Phos a Frankenstein's monster appearance of mixed colours and a messy design that doesn't do the art any favours. I really do want to like Houseki no Kuni more. A lot more. But I'll keep reading it anyway. Although, the change of personality because of a traumatic experience is similar to other mangas such as Tokyo Ghoul. The main character of Houseki no Kuni whose name is Phos has a particular character development that differs from them. Maybe it is probably because of her/his lack of perception and the ways she/he tries to achieve her goals. Aside from the character development and the unique story, I think this manga also provides a nice food for thought because of the philosophical chats about relationship, growth and others which I appreciate.